Happy 125th year anniversary to Shell Malaysia! To celebrate this big milestone, Shell Malaysia has initiated an art project called ‘Celebrating 125 Years’, which it has collaborated with 8 artists to produce 15 murals at selected Shell stations nationwide. 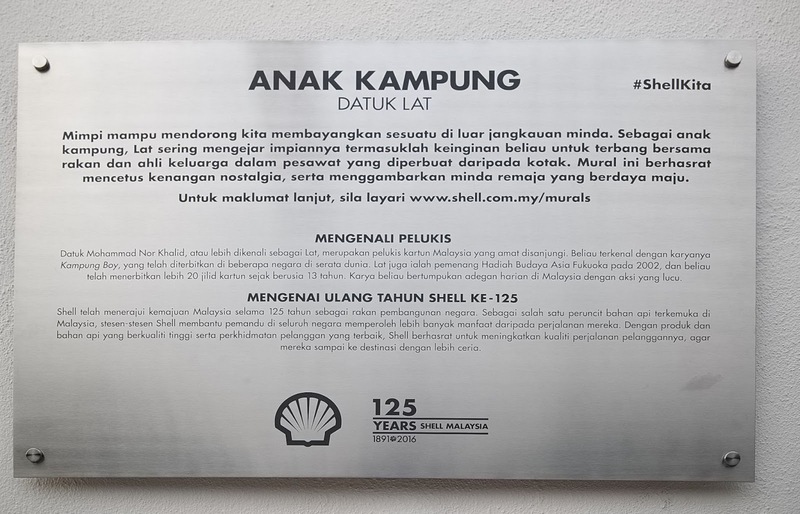 Shell Malaysia ‘Celebrating 125 Years’ Mural Arts is aim to share society’s common values such as diversity, unity, respect, inclusiveness and courage to dream. The murals capture each artists’ own interpretation of progress and the Malaysian pioneering spirit. They illustrate familiar Malaysian scenes and landmarks, while others showcase nature and our society. 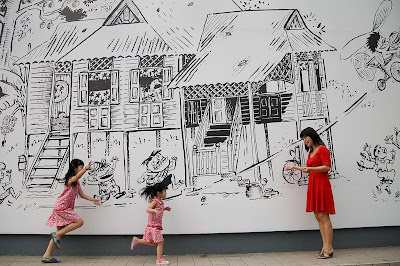 Talking about Murals, it is very popular in Malaysia, and we Malaysian love to take pictures with the Murals and share with others on social media don’t we. 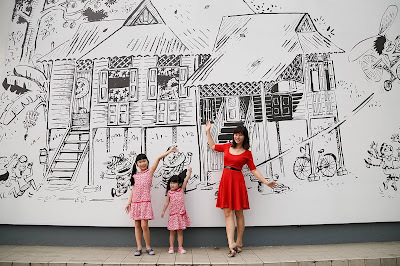 This time, we are not only get to see and take picture with the creative Murals at the selected Shell station, we could also win RM 500 free fuel by doing that! How cool is that?! 1. Visit the Shell stations where the murals are located. 2. Take a creative photo with the mural, upload it to Instagram with the hashtag #ShellKita. Make sure your profile is set to ‘Public’. 3. Tag at least 2 friends on Instagram. 4. Optional task which will increase the chances of being shortlisted: include a caption of not more than 40 words to explain how the mural inspires you. The most creative submissions will stand a chance to win free fuel worth RM 500. There are 10 prizes in total. So hey, let’s visit all the 15 murals at selected Shell stations nationwide to take pictures now! Who knows we could be one of the winner too, right. 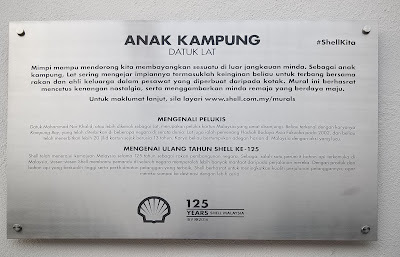 On my back is one of Shell Malaysia ‘Celebrating 125 Years’ Mural art named ‘Art Spirit’ by Caryn Koh. Imagination is one of the most remarkable powers of the mind, and perhaps the most picturesque of all. In this mural Caryn captures the spirit of imagination through the use of vivid colours and patterns. 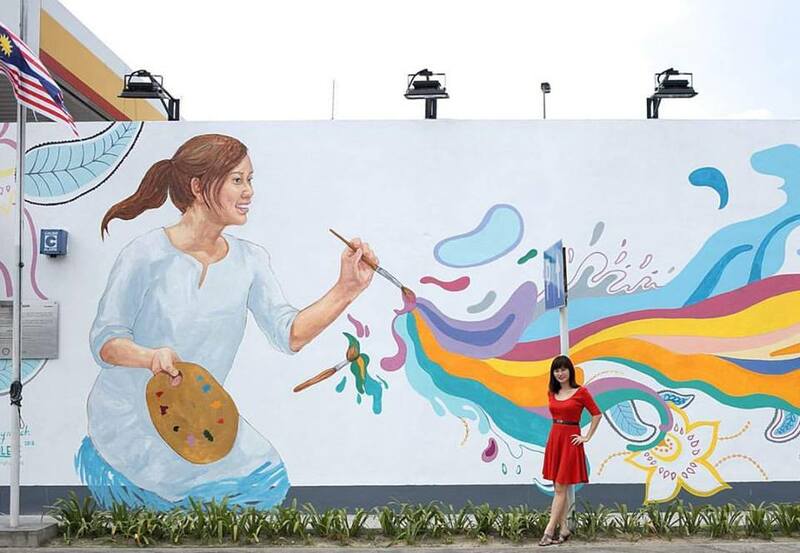 A secondary schoolgirl, representing the younger generation, is depicted casually splashing paint across the wall. Traditional motives for the mural’s fringes, representing the diversity of Malaysia culture. Caryn hopes to highlight the importance of experimentation in cultivating the imagination of our youth, by allowing them the freedom to express themselves in their own unique way, either through art or by other means, society’s next generation of leaders will be better equipped in driving the nation forward. We can ‘paint’ alongside the schoolgirl by holding onto the second paint brush in this Mural Art. For me, I used my imagination from my brain to paint along with the schoolgirl. 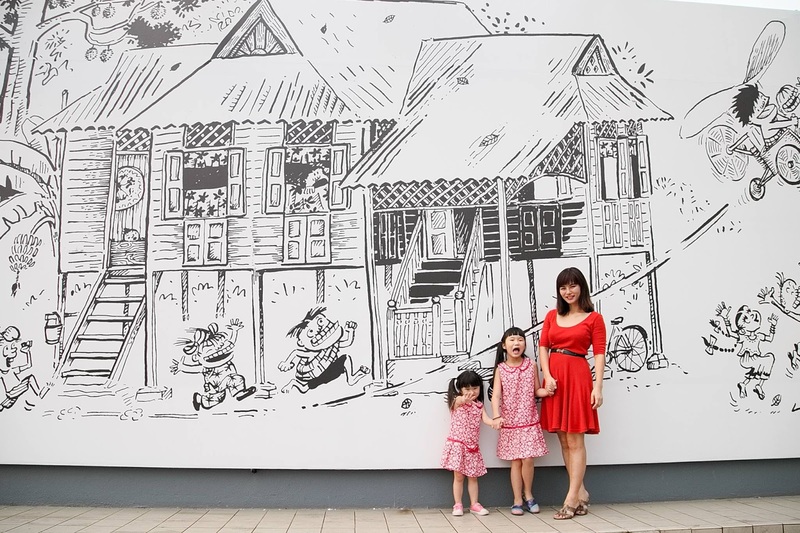 The ‘Art Spirit’ Mural Art is located at Shell Kesas R&R Kinrara, KL. 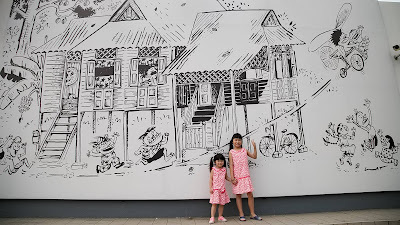 We also visited Shell Jalan Tun Razak to snap pictures with ‘The Kampung Boy’ Mural Art by Datuk Lat. 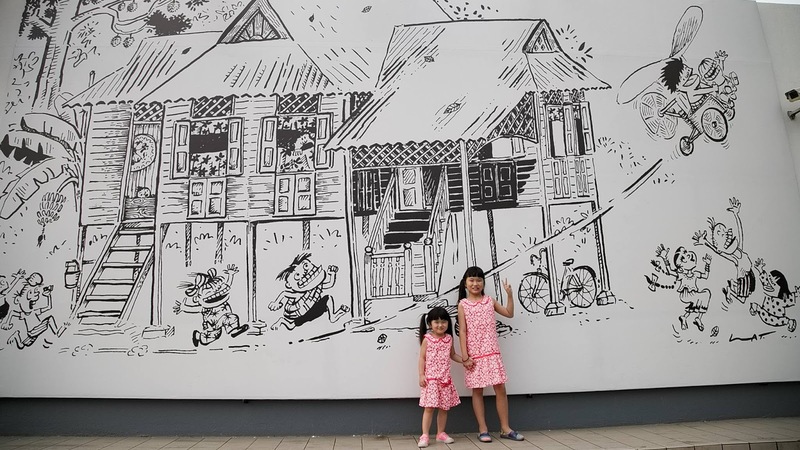 As one of the most well-known and well-loved cartoonist, Datuk Lat has shared with us his Dreams are powerful – they drive us to imagine the unthinkable and go beyond our normal limits. As a young boy living in the kampong, Lat was guided by his dreams, which included imaginary flights with friends and family in homemade box carts. This mural brings to life one of Lat’s many dreams, a nostalgic memory to illustrate the progressiveness of youth. My girls were having a day dream that they were playing in the traditional 'kampung' with the kampung boys. They love the Mural Arts a lot. I strongly encourage all the parents to bring their children and friends to see all the Shell Malaysia ‘Celebrating 125 Years’ Mural Arts. Firstly it could boost their imagination and creativity, and secondly we could also teach them to appreciate the valuable art pieces created by the creative artists. They are more Mural Arts by other artists like Amey Sheikh Ali, Cheeming Boey, Yap Hanzhen, Sabek, Nazri Amran (Dmojo), and Thomas Powell . Now, it’s time for us to head to the 15 murals at selected Shell stations nationwide, have fun taking creative photos (be it selfie or wefie) and join ‘Our Canvas, Your Story’ photo contest on Instagram. I didn't even know about this contest. And the good news is that Ipoh is not left out. We have a Shell with a mural done by Lat, no less. Yay, going to visit it soon. Hi. 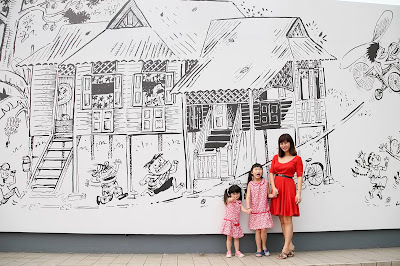 This is the first time I dropped by your blog and immediately, what stood out for me is the black and white mural as background, with you and that is our little ones in red. It is very beautiful. family bonding time while stand a chance to win rm500 fuel fee,why not? good luck! The art spirit...is really nearby to my house...i want to join! This is an amazing project. Art also brings everyone together, besides sports. Seem interesting! Pretty sure your kids had a blast on that day. love art as it is beautiful and it brings colours to life! thanks shell! all the murals look really beautiful! !so creative ler! The murals are really pretty and classy looking! interesting.. before this i did not even know these murals exist. Nice art! LOVE THE MURAL! !